– the solitary grandeur of Melbourne’s CBD between the hours of 10 p.m. on New Year’s Eve 2008, and 2:30 a.m. on New Year’s Day 2009. 11:06 pm, ‘Thou Shalt Pray’, Off Meyers Pl. 10:31 pm. ‘ One Too Many?’, Bourke St, outside Metro nightclub. 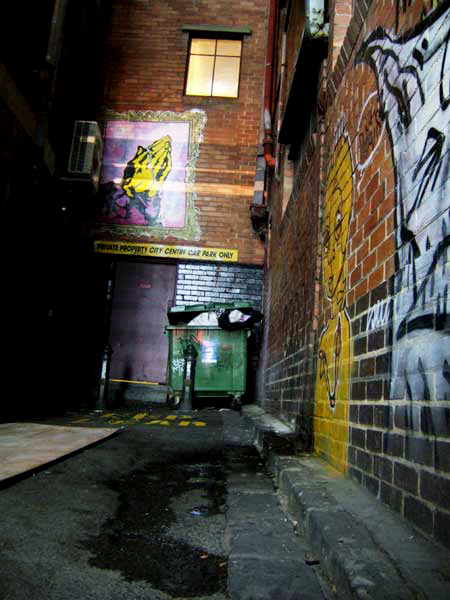 10:38 pm, ‘Glass Blocks’, Laneway off Bourke St.
10:53 pm, ‘Do Androids Dream of Electric Duck?’, Meyers Place. 11:06 pm, ‘Thou Shalt Pray’, Off Meyers Place. 11:14 pm, ‘=>’, outside Naval Officers’ Club, Flinders Lane. 11:21 pm, ‘Shadow Lines’, Collins Street. 11:25 pm, ‘The Quiet Revolution’, outside Collins Place, Exhibition St.
11:35 pm, ‘Entry Exit’, Flinders Lane. 11:38 pm, ‘Smoko’, Hyatt Hotel Staff, Off Flinders Lane. 11:45 pm, ‘No Standing Anytime’, Flinders Lane. 11:47 pm, ‘Dancing Girl’, Oliver Lane, off Flinders Lane. 00:00 am, Jan 1st 2009, ‘The Red and The Blue’, rear St Paul’s Cathedral, Flinders Lane. 12:03 am, Jan 1st 2009, ‘Happy New Year!’ Flinders Lane. 12:09 am, ‘Happy New Year!’, Hosier Lane. 12:17 am, ‘Aaagghhhh…I’, St Paul’s Cathedral. 12:25 am, ‘Aaagghhhh…II’, St Paul’s Cathedral, opp. Flinders St Station. 12:33 am, ‘Phone a Friend’, rear St Paul’s Cathedral. 1:36 am, ‘Doors of Perception’, Lt. Bourke St.
1:45 am, ‘The Hands of Time’, Lt. Bourke St.
2:11 am, ‘Ladies’ Toilets’, GPO, Elizabeth St.
2:15 am, ‘Men’s Toilets’, GPO, Elizabeth St.